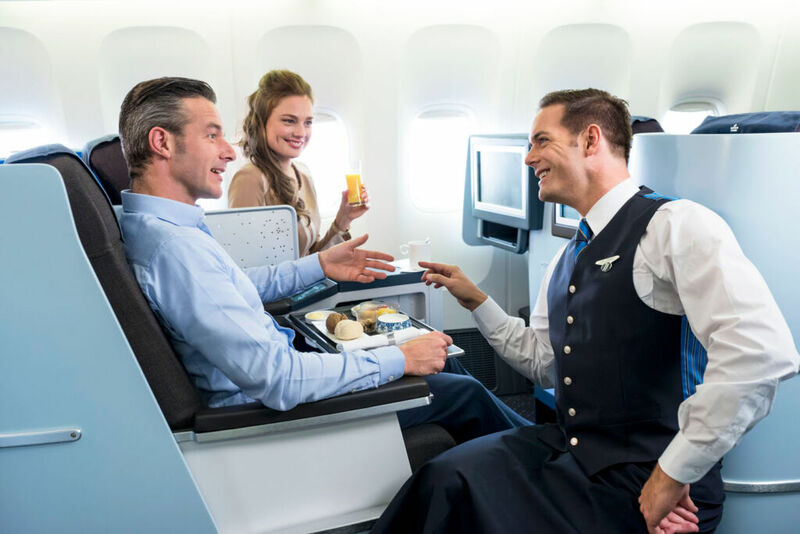 Gina Baksa experiences KLM’s World Business Class on a flight between New York JFK and London Heathrow. Turning left when boarding an aircraft has to be the ultimate way to travel, so I was excited to experience KLM’s World Business Class on a recent trip from New York JFK to London Heathrow. Thanks to KLM’s partnership with Delta, I had full access to the impressive Delta Sky Club Lounge at JFK’s Terminal 4. Time to shower, relax and catch up with some reading before my early evening flight back to London. Although the lounge is a long way along B concourse at B33, the walk is worth it. This massive and very welcoming space is well equipped and even though full when I arrived, was very well staffed and clean. Choose from (paid-for) table service or the complimentary buffet with salads, soups and desserts. Food quality was good, as was the selection of comp drinks with a decent wine list. I found it easy to relax, despite the constant ebb and flow of passengers. My tips? Avail yourself of the fabulous showers and head for the outside roof deck with direct views of the runway. Such a treat on a sticky Spring day. Delta Sky Club Lounge’s concierge desk was well informed, and I felt refreshed and calm as I made my way to the gate. Plenty of seating here, and the experience was further enhanced by a very capable Delta staff member re-booking my cancelled flight from Amsterdam to London. 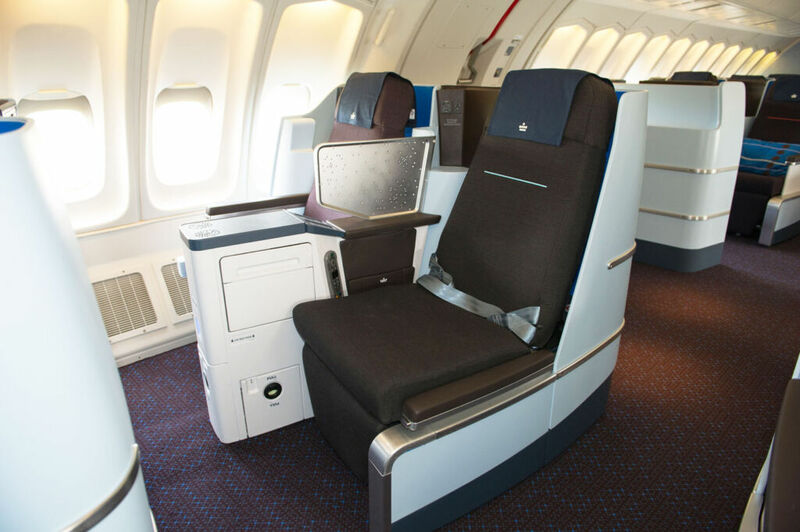 KLM business class configuration is 2:2:2 in the B777-200 for winter. For their summer schedule (now in action) KLM uses their new Dreamliner B787 with 1-2-1 configuration and direct aisle access for all seats. I highly recommend seat 4A – on the left and pitched at an angle to the window, it is also slightly in front of the adjacent seat affording more privacy. 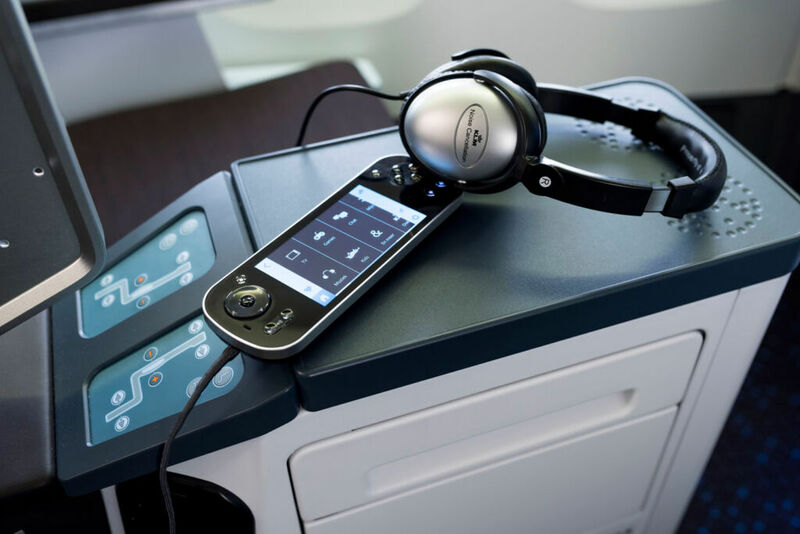 That and a small screen with its subtle constellation motif provided an additional ‘barrier’ – one luckily that I didn’t need as my neighbour seat remained unoccupied throughout my flight. The centre console is also shared and contains seat control touch buttons and a table top. And there is free Wi-Fi. As long as your neighbour isn’t asleep direct aisle access is easy, although not as generous as some of KLM’s competitors. My seat was very comfortable: supportive at any angle, yet not too firm with easy-to-use controls. KLM are justifiably proud of their 63-inch/160cm seat pitch in World Business Class, but the piece de résistance are the 81.5 inches/180cm-flat beds – more on mine later. The cabin crew were cheerful and exceptionally helpful and efficient, serving Champagne and orange juice as soon as we were settled, alongside a blue-and-white Dutch china bowl filled with delicious nuts – a nice touch. There’s also a good selection of soft drinks as well as herbal and regular teas (Rooibos included) and coffee. I particularly enjoyed the warm refresh towel and the cabin temperature was perfect. We were given dinner menus at this point after I enjoyed a Flying Dutchman cocktail mixed specially for KLM by Dutch distiller Bols, using Damrak gin, Bols blackberry liqueur, fresh lemon juice and sugar syrup. Mix it with some of the complimentary Nicolas Feuillatte Brut Réserve Champagne for a great bubbly cocktail. 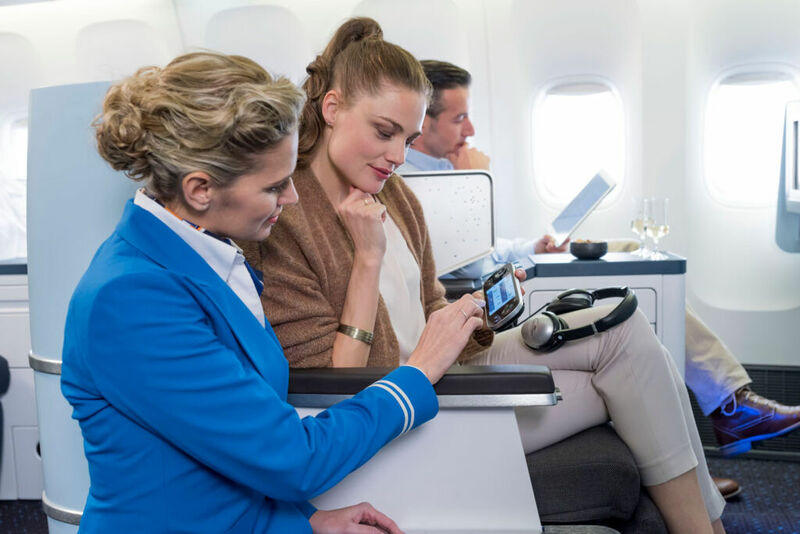 KLM’s World Business Class cabin is a subtle colour mix of light blues, combined with darker blues for the seat coverings with their KLM-crown headrest cover and red stripe accent. The dark blue theme continues in the carpets which are made from recycled quality materials, including rather surprisingly recycled stewardess uniforms blended into a new yarn and interwoven with Scottish sheep’s wool. Designer Hella Jongerius’ vision was to make the cabin less business and more ‘at-home’ class. She’s succeeded. The cabin felt warm, cosy and welcoming, yet professional. We were given cool amenity bags from Dutch designer Jan Taminiau. He’s designed six in the range in male and female editions. Mine fitted perfectly in the space below the 17-inch entertainment screen. Noise-cancelling headphones were comfy and provided great sound. I do love good storage on flights and KLM has thoughtfully provided enough for all your bits and bobs. From the footwell to the small area behind my left shoulder where the audio and power sockets are located. There’s a reading light here too although I didn’t use it.